The present invention relates to a bus converter for use with a data processor adapted to operate with a wide data bus, for rendering the data processor compatible with external devices adapted to operate with the wide data bus and external devices adapted to operate with a narrow data bus, as set forth in the introductory part of claim 1. A wide variety of microprocessor integrated circuits have been made by a variety of manufacturers in recent years. For various reasons, several of these microprocessor integrated circuits have become more widely used than others. Manufacturers, in order to provide the maximum compatibility between microprocessors of different generations have generally tried to retain the same or similar instruction set between various versions of their microprocessors. One example of a microprocessor integrated circuit in common is the 8088 integrated circuit which is manufactured by the Intel Corporation. The 8088 microprocessor integrated circuit is widely used in a variety of microcomputers and personal computers. Some of these computers have enjoyed a large degree of consumer acceptance and therefore a large software base has been written for them by third party software vendors. Also, a large variety of peripherals have been designed for such computers by third party manufacturers. In designing a new computer, many manufacturers have found it desirable to design a computer which can take full advantage of this software base and these peripherals while still incorporating advances provided by the technology available in microprocessors having the same instruction set that are faster and more powerful. The Intel 8088 microprocessor integrated circuit, like many others, has an internal 16-bit data bus, but in order to decrease complexity, although a concomitant loss of speed, only has 8 data lines brought external to the microprocessor. Thus, in order to provide 16 bits of data on to the internal 16 bit data bus, data must be taken serially in two successive 8-bit bytes. Since these bytes occur on successive clock pulses, there is an obvious loss of speed as compared to a microprocessor in which both bytes of a 16-bit data word are entered in parallel on one clock pulse. An improved version of the 8088 microprocessor integrated circuit also manufactured by Intel Corporation, is the 8086 microprocessor integrated circuit. This uses the same instruction set as the 8088, but permits external access to its internal 16-bit data bus with a single 16-bit wide word. In other words, two 8-bit bytes are accessed in parallel. Additionally, both the 8086 and the 8088 can be run at a clock frequency of 5 MHz or 8 MHz. Thus, it is clear that it is desirable to be able to utilise a microprocessor such as the 8086 at its maximum working clock frequency, while being compatible with the existing software base. Heretofore, a manufacturer of a computer who wished to maintain compatibility with software and peripherals designed for the 8088 microprocessor and who also wished to obtain the greater speed available with the 8086 microprocessor, had to sacrifice a degree of compatibility with the software and peripherals available for use with the 8088 based computer. While the instruction set may have remained identical, the process in which data is moved throughout the computer's internal data bus architecture is different. Therefore, much software and most peripherals designed to work on an 8-bit data bus were adversely affected. The methods chosen to retain compatibility have been transparent to neither the software or the peripherals, or have only worked in limited cases. Most peripherals, for example, a floppydisk controller, accept 8-bit wide data statements. This is not a problem with the 8-bit wide data bus of an integrated circuit such as the 8088. Much of the widely available software, however, writes information directly to the peripherals. Thus, such software cannot be used with a computer set up only for a 16-bit data bus using 16-bit peripherals. A second problem arises as stated before, since the less powerful 8088 microprocessor reads instructions in successive bytes. Without some conversion, the external 16-bit data bus computer in, for example, 8086 based computers only reads from the bus to which the peripheral, such as the floppy disk controller, is connected and ignores the second or successive byte so that a portion of the 16-bit data bus, ordinarily the upper or odd portion, would receive all zeros in a write operation since there would be nothing connected to it. In a read operation, the 8086 would receive only half the information it expected. Certain operations performed by the 8088 microprocessor require two successive bytes, while others require only a single byte. For example, the instruction MOV AX, [BX] requires two bytes to be moved between the microprocessor accumulator and the system memory addressed by BX. In an integrated circuit such as the 8086, such as data transfer may be done in one 16-bit word operation. The data bus is arranged to have even bytes on one half of the word and odd bytes on the other. Both bytes are addressed simultaneously and in parallel. It is also desirable to be able to utilize the full 16-bit wide capabilities of the 8086 microprocessor when it is used with devices, such as peripherals, memory expansion or other input/output devices that are designed to operate with a 16-bit wide data bus. A circuit for adapting the operation of a 8-bit system to a 16-bit system, is known from Electrical Design News, 29 (1984) Aug. No. 16, pp. 199-206 which discloses a circuit arrangement for adapting the S-100 bus originally designed for 8-bit 8080 microprocessor systems to work with a 16-bit NS 32106 microprocessor. More specifically, the disclosed circuit illustrates how to use two 8-bit portions of the S-100 bus (conforming to IEEE-696 standard), to handle 16-bit words by using 8-bit bidirectional buffers, a 8- bit latch and a 8-bit buffer. IBM Technical Disclosure Bulletin, Vol. 26, No. 5, October 1983, page 2659 suggests generally to use buffers and a control unit for the correct loading in series or in parallel of one-byte and two-byte signals. No specific circuit details are however given. This known prior art, however, does not specifically teach how to resolve the previoualy stated problem of realizing an interface capable of allowing the use of a 16-bit microprocessor such as the 8086 in order to maintain a full compatibility with the software designed for the 8088 microprocessor, as previously detailed. The bus converter according to the invention is characterised as set forth in claim 1. In accordance with an illustrative embodiment of the present invention, there is provided a bus converter for making a data processing device designed for use with a two-byte wide data bus compatible with one byte device external to the data processor, as well as retaining compatibility with nm byte wide devices. The bus converter transmits to and receives data signals from the data processor two byte wide data bus, and divides this data bus into lower and higher portions. The data processor may have an instruction set having both one and two byte wide operations. The bus converter detects whether the external device is two byte or one byte wide device. If it is two bytes wide the bus converter is bypassed. If it is a one byte wide device, it is connected to the bus converter's narrow, one byte wide data bus. If it is a one byte wide operation, the converter detects which byte portion should be coupled to the external device and selectively couples it. If a two byte wide operation is called for, the converter sequentially couples the lower portion after the higher portion to the one byte wide external devive. Fig. 3 is a flowchart explaining the operation of the present invention. Refer now to Fig. 1 in which a block diagram of a bus converter according to the present invention is shown. The bus converter permits 16-bit data transfer as well as 8-bit transfers to be used in an 8086 or other 16-bit microprocessor having a 16-bit wide data bus. When operated to accommodate 8-bit data transfers, the bus converter appears transparent to the software and/or peripherals. The bus converter permits the same machine to be compatible with older software and peripherals designed for use with an external 8-bit data bus as well as newer, improved software and peripherals which take full advantage of an external 16-bit data bus architecture. It should be emphasized that the data busses must be bidirectional to permit the flow of data both to and from the microprocessor. In order to permit 16-bit data transfers, a signal designated as 16BCH is received on line 10 and coupled to the timing and control logic 11. The signal 16BCH determines whether an 8-bit bus or a 16-bit bus external device is present and is generated by a 16-bit bus device such as memory expansion circuitry, peripheral or other input/output devices. When a 16-bit transfer is to occur signalling that the peripheral or other devices can communicate with 16-bit words, the 16BCH signal indicates this to control logic 11. Refer now also to Fig. 3 which shows the operational flow of the present invention. Memory reads (AMRD), memory write (AMWR), input/output read (AIOR) and input/output write (AIOWR) are coupled to terminals 20, 21, 22 and 23, respectively and receive signals from the microprocessor or other data processor. These are logically OR'ed in and gate 24 or equivalent to produce a data command (CMD) signal which is also applied to timing control logic 11 that signals the presence of any one of the data command AMRD, AMWR, AIOW or AIOR signals. Without the presence of at least one of these four signals, the bus converter will remain inactive, or in an idle state. In Fig. 3, this is shown as the first decision in which it is determined whether or not a data command is present, that is, whether or not the CMD signal is active. As shown in the flowchart of Fig. 3, if there is no command signal (CMD) present and/or if a 16BCH signal is present then the bus converter is in an idle state and does not do anything further. The bus converter is not needed to effect 16-bit data transfers, and is effectively bypassed. In practice, this may be accomplished by generating signals as follows. AND gates 25, 26, 27 and 28 receive a command enable (CMDEN) signal from timing and control logic 11. These AND gates are also coupled in parallel to the input terminals 20, 21, 22 and 23. The command enable signal will change stage to cause AND gates 25 to 28 to be disabled and thus disable the data commands to the 8-bit external device, namely, B memory read (BMRD), B input/output read (BIOR) B memory write (BMWR), and B input/output write (BI/OW). In a 16-bit transfer, the data is transferred in a 16-bit word operation which is not compatible with the 8- bit data lines and therefore should not affect devices coupled to these lines. When a 16-bit data transfer occurs in addition to the command enable disabling the 8-bit data bus transfer command lines, it also generates a signal HLEN (high to low enable) which through AND gate 35 disables buffer 31. Signal LSTB is also generated which through AND gate 42 disables data latch 39. Buffer 31 is a unidirectional device which provides buffering between input port 31A and output port 31 B and will pass data from input port 31A to output port 31 B, in the direction indicated by arrow 31C when an enable signal is received at the EN (enable) input. Latch 39 is a latch, such as a D-type flip-flop, which will transfer information from the D input to the Q output in the direction 39A when enabled at the terminal 39B and stores this information until cleared or it is fed new information. Buffer 31 and latch 39 together form a data path over which data from the microprocessor or 8 or 16-bit peripheral is directed, depending upon whether a read or a write operation is to be performed. During a write operation in which a 16-bit or 8-bit conversion is required, the two bytes available from the CPU via data busses 50 and 52 are available simultaneously. They are written in sequence on to 8-bit data bus 60 one byte at a time. The functions thus required are to enable or disable elements between the path of data busses 50 and 52 and data bus 60. Buffers are well suited for this function, and therefore elements 31 and 38 may be buffers. During a read operation, two bytes from data bus 60 must be fetched sequentially. Thus, a memory function is requirerd, and a latch can be selected as element 39. The signal address change signal (ADCHG) is applied to exclusive OR gate 32 where it is exclusively OR'ed with the AO address line signal received from the 16-bit data processor on line 34. The resulting signal from exclusive OR gate 32 provides the BAO signal at terminal 46 which is coupled to the 8-bit external device. The signal ADCHG changes state (goes low) upon the presence of 16-bit data transfer which thus permits the data transfer of the AAO memory address signal unchanged to become the BAO bus signal to the 8-bit compatible device. The ADCHG signal is used to produce the MBDIS (mother board buffer disable) signal which is connected to the mother board to disable the bidirectional data buffer 38. Data is transferred through buffer 38 only during memory access (DMA) and 8-bit data transfers. Due to the disabling of latch 39 and buffer 31 and 38 there will be no transfer of data or 8-bit 60 during a 16-bit data transfer. The operation of the bus controller is considerably different during 8-bit data transfers. During 8-bit data transfers, 8-bit wide devices external to the microprocessor, such as input/output expansion boards communicate with the microprocessor 16-bit data bus 50 through the bus converter. If an 8-bit transfer occurs, the 16BCH signal appearing on line 10 will not signal the presence of a 16-bit data transfer since it will not be generated by an 8-bit external device. Depending upon whether an active high or active low signal is needed, 16BCH will go low or high, respectively. When one of the data commands AMRD, AMWR, AIOR, or AIOW is present, the CMD (data command) signal is generated, and as shown in the flowchart of Fig. 3, the device will advance to the step where the 16-bit microprocessor is stopped and set ready. The microprocessor will thus wait for the data transfer. At this time, the signal CYCLE which is generated from an AND'ing at 72 (Fig. 2) of the abovementioned CMD signals and the 160BCH signal will go high and begin the cycle of the timing and control logic 11. Next, it is determined whether or not a word operation, that is, a double cycle or 2-byte operation is being requested of the microprocessor. This is determined depending upon the status of a signal BHE (byte high enable) received from the microprocessor and the address AO. The BHE is an active, low signal which indicates that the high byte operation should be followed when BHE goes low. Word operations occur on an even address and therefore AO equal 0. 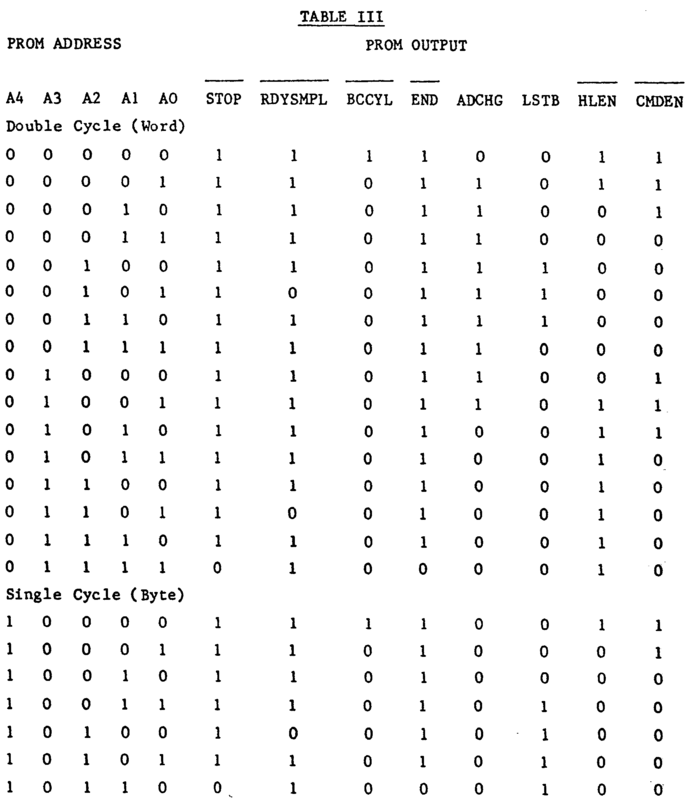 Byte or word operation is determined by decoding the BHE and AO signals to produce a byte/word result according to the following Table I. This is performed by OR gate 70 of Fig. 2. Word operation always occurs on an even address in a 16-bit microprocessor such as the 8086. Thus, if the high byte has been enabled and AO equals 0 a whole word or double cycle operation is indicated. In Fig. 3 this is shown as a branching off to the righthand side of the program. If, however, either the high byte has not been enabled or the address AO is equal to 1 (indicating an odd address) a single cycle or one byte operation is indicated. If the high byte is enabled, it is clearthat a high byte operation is indicated. Similarly, if the high byte or the BHE has not been made true, a low byte operation must be intended. Refer again to the flowchart of Fig. 3. If it is found that the operation is not a word operation, the lefthand side of the flowchart after the decision will be followed. As a first step, the appropriate data bus portions 50 or 52 will be enabled depending upon the status of BHE. As stated before, if BHE indicates a high byte, the data bus portion 50 corresponding to data bits D8-D15 is chosen. If, however, the BHE signal indicates that it is a lower byte operation, then the data bus 52 which carries data bits DO-D7 is selected. The signal HLEN is generated by logic 11 and enables buffer 31 if a write operation is to progress to permit data bus D8-D15 to go to the 8-bit device. HLEN is anded in AND gate 35 with the write command (WCMD) signal since information is to be passed in the direction of arrow 31C only if data is to be written into the memory or other external device coupled to 8-bit data bus 60. WCMD is generated by OR gate 36 which samples the AMWR and AIOW. If either one is high a write command is indicated. When LSTB goes high, it will enable latch 39 and hence data bus DO-D7 to pass through this buffer when it is enabled. This will happen on a read command (RCMD) signal i.e. when the microprocessor is to read data from the 8-bit peripheral. RCMD is generated by OR gate 21 which samples the AMRD and AIOR. Thus, data on data bus 60 will pass through this latch to the microprocessor to become D8-D15 on a read operation. When BHE is high, the data lines DO-D7 go directly to the mother board as the lower byte via buffer 38. The command enable signal (CMDEN) will be set high to permit AND gates 25, 26, 27 and 28 to be enabled and thus the signals AMRD, AIOR, AMWR or AIOW are permitted to go through the AND gates 25 to 28 to activate any one of the signals BMRD, BIOR, BMWR or BIOW depending upon which operation is to be performed on the appropriate 8-bit external device. In the next two steps, the bus converter will wait for a ready signal (RDY) from the peripheral or other device. This is a signal generated by the external device indicating that it is ready to receive any one of the previously mentioned four data commands. Wait for ready is accomplished by first sampling the RDY from the peripheral then checking to see whether or not the ready is activated or not. If it is not, the program returns to sample RDY again. If it is, however, in an active condition, the timing logic will proceed further in the cycle, at the end of which the 16-bit microprocessor (e.g. the 8086) is released indicating that read data is available or write data has been written into the peripheral. This is performed through the line 45. The bus converter then checks to see if CMD is true, that is, if any of the data commands are still active. If so, the bus converter remains in the same state so that the 8-bit data transfer can continue. If not, however, the bus converter will return to the start and the sequence can begin again. Referring again to Fig. 3, if a word operation has been selected according to the previously given table, two successive data bytes will be received from data bus 60 in a read operation. During a write operation the high (D15-D8) and low (DO-D7) portions of the 16-bit data bus will be successively sent to the peripheral. First, the converter changes the data address to odd, since as stated above, in word operations the address is always even. This is done via the previously ADCHG (address change) signal. The signal ADCHG will always be low for byte operations. This also provides the MBDIS signal which disables the 16-bit microprocessor data buffer 38 and data lines DO-D7 from the microprocessor. The ADCHG signal is also input to the exclusive OR gate 32 and on a word operation drives the signal BAO high. As a next step, the high to low path is enabled. On a write operation when the signal HLEN is active buffer 31 is enabled. On a read operation when the signal LSTB is active latch 39 is enabled. The command enable signal then enables AND gates 25 to 28 to permit the passage of the appropriate read, write, input/ output read, or input/output write signals. The bus converter next waits for the RDY signal from the peripheral. If the peripheral is ready, it will provide a strobe signal to permit the data transfer to take place by storing the data in latch 39, otherwise, it waits for the RDY signal. AND gates 25-28 are then disabled by CMDEN and therefore prevent the data commands from passing to the 8-bit boards. To pass the low bytes the low to low path is enabled by setting the HLEN signal to disable buffer 31, and the LSTB signal to disable latch 39. This permits the DO-D7 signals appearing on bus 52 to pass on to the 8-bit data bus 60 and to the 8-bit external device, and also permits data transfer in the reverse direction. The address, which has previously been changed to odd by the ADCHG signal, is now returned to even by resetting the ADCHG signal and the CMDEN signal is now set to enable AND gates 25 to 28. Once again, the bus converter will wait for the RDY signal from the peripheral; when it is ready the 16-bit microprocessor is released to send the data to the 8-bit peripheral. Next, it is determined if the CMD signal is still active. If it is, the converter is held in the same configuration, to permit any further data transfer. If not, the process returns to the start position to re-begin. Refer now to Fig. 2 in which timing and control logic 11 is shown in greater detail. The heart of the timing and control logic 11 is PROM 100 the program of which is addressed in the proper sequence by counter 102. Counter 102 is driven by a clock signal received on line 104 which may be the same clock signal utilized by the 16-bit microprocessor. In the example of the 8086, the clock signal may be 8 megahertz. Counter 102 has inputs 102A, B, C and D tied to ground. When a command signal CMD is received, and a 16BCH signal is received the CYCLE signal is generated by an AND gate Y2 indicating that the cycle is to begin. The CYCLE signal is coupled to the load terminal of counter 102. When this signal is made active, counter 102 will load into its internal registers whatever number appears at its A, B, C and D inputs. Since they are tied to 0 or ground, zero is loaded to begin the count. The output of the counter in this case will be all zeros and is used to address the inputs to PROM 100. Address inputs A0, A1, A2 and A3 of PROM 100 are coupled to the outputs QA, QB, QC and QD of counter 102. Address inputs A4 is coupled to OR gate 70 and will be discussed in further detail hereinbelow. Whenever all zeros are applied to inputs A0, A1, A2 and A3 of PROM 100, regardless of the state of input A4, the PROM output will be as shown in Table 11. This provides the signals necessary to perform a 16-bit data transfer and the signals that are output are utilized as previously described. The additional signals STOP and RDYSMPL are used to inhibit counter 102 during 8-bit data transfers while signal END is utilized together with the CYCLE signal to produce a signal that indicates that a 16-bit transfer can take place. The signal BCCYL indicates if the bus converter cycle is active or not and may be utilized by the microprocessor. If an 8-bit transfer is to occur, however, the 16BCH signal will not indicated that a 16-bit channel transfer is about to take place. If one of the data command signals is high it will then cause a CMD signal to be generated. The CYCLE signal will thus go through a transition which starts counter 102. Counter 102 starts counting at a rate of 8 megahertz until the counter is stopped. The counter stops when it receives the appropriate signal on its enable inputs ENA or ENB. As the counter goes through its count, it will provide a new output at its output terminals with each count depending upon how the PROM has been programmed. Counter 102 is a 16-bit counter which will return to a count of 0 after it has reached a counter of 15 (1111), as shown in Table III below. The A4 address input is derived by OR'ing the BHE and the AO signal. The A4 input distinguishes between double cycle or word operations and single cycle or byte operations. The difference between the cycles is selected by input A4 of the PROM which is low for a word operation and high for a byte operation. It will be noted that many of the outputs of the PROM in Tables II and III are given in terms of their inverse function. This merely reflects that in one specific embodiment, the particular hardware latches, buffers, etc. utilizing these signals operate on negative logic signals which may also be provided when needed by simple inverters at the appropriate places. The PROM output RDYSMPL is used together with the RDY signal to temporarily stop counter 102 as long as the signal RDY is low during the period in which RDYSMPL is 0. As soon as the RDY signal goes high (i.e. = 1), signalling that the device on the bus is ready, the counter will be enabled again. These signals are NOR'red in NOR gate 108 the output of which is coupled to the ENA input of counter 102. Counter 102 will be disenabled when a 1 is applied to its enable A output. Of course it will be clear that in other embodiments of the invention, it is possible to employ a counter which is enabled on application of a high signal, in which a case a NAND gate could be used in place of AND gate 108 or other logical equivalents, such as an OR gate with inverted inputs. The STOP signal can be seen from Table II will be 1 until the end of either the double cycle or single cycle. The STOP signal is shown here as an active low signal and is coupled to one of the enable inputs of counter 102. When it goes low, it disables counter 102 and causes it to stop any further generation of control logic signals. The PROM output is each time latched by a latch 105 which is clocked by the signal CLK and is controlled by the RDY signal through an AND gate 106. The invention has been described for the case of a wide bus of 2 bytes and a narrow bus of 1 byte but other widths may be employed and the wide bus could be ocmposed of more than two portions each having the same width as the narrow bus. In this case one portion would communicate via a bidirectional buffer 38 and each of the other portions would communicate via its own buffer 31 and latch 39. 1. A bus converter for use with a data processor adapted to operate with a wide data bus (50, 52), for rendering the data processor compatible with external devices adapted to operate with the wide data bus and external devices adapted to operate with a narrow data bus (60), wherein the wide bus comprises a plurality of portions (50 and 52) each of the same width as the narrow bus (60), selecting means (38,31,39) being provided for selectively connecting the said portions to the narrow bus and wherein the instruction set on the data processor includes both wide data operations and narrow data operations, characterized in that the bus converter includes control logic (11) for detecting whether an operation is a wide data operation or a narrow data operation so to control the selecting means (38, 31, 39) as to couple a selected portion (50 or 52) of the wide bus to the narrow bus (60) in the case of a narrow data operation and to couple the portions (50 and 52) of the wide bus sequentially to the narrow bus (60) in the case of a wide data operation, the control logic (11) comprising a counter (102) addressing a read only memory (100) which sequentially generates an enable signal (CMDEN) for enabling a data operation and signals (HLEN, LSTB, ADCHG) controlling the selecting means (38, 31, 39). 2. A bus converter according to claim 1, characterized in that the said portions (50, 52) correspond to high and low bytes, the data processor generates a type signal (BHE) indicative of whether a data processor operation is a high or low byte operation, and generates address bus addresses including a lowest address bit (AO), the data processor performs word operations on even addresses only, and in that the control logic (11) comprises logic means (70) for logically operating on the type signal (BHE) and the least significant address bit (AO) to provide an output signal to the most significant address bit (A4) in the memory (100) to distinguish between byte and word operations. 3. A bus converter according to claim 1 or 2, characterized in that the selecting means (38, 31, 39) include a bidirectional buffer (38) between one portion (52) of the wide bus (50, 52) and the narrow bus (60). 4. A bus converter according to claim 3, characterized in that the selecting means (38, 31, 39) further include a second buffer (31) for coupling a second portion (50) of the wide bus (50, 52) to the narrow bus (60). 5. A bus converter according to claim 4, characterized in that the selecting means (38, 31, 39) further include a latch (39) for coupling the narrow bus (60) to the second portion (50) of the wide bus (50, 52). 6. A bus converter according to any one of claims 1 to 5, characterized by command lines (20-23) for carrying read and write commands from the data processor, and command detecting means (24, 41) for detecting whether the data processor is requesting a read or write command and for generating a signal indicative of a read command (RCDM), signal indicative of a write command (WCDM) and a data command signal (CMD) indicative of either a read or write command. 7. A bus converter according to claim 4 and claim 6, characterized in that the second buffer (31) is a unidirectional buffer which is enabled only when the write command (WCDM) is present. 8. A bus converter according to claim 5 and claim 6, characterized in that the latch (39) is enabled only when the read command (RCDM) is present. 9. A bus converter according to claim 6, 7 or 8, characterized by enabling means (25-28) cooupled to the data processor command lines (20-23) and in that the control logic (11) responds to the data command signal (CMD) to generate the enable signal (CMDEN) for enabling the enabling means to pass read/write commands to the external device.